Vesa: Sons Of Angels started the show. For me they were one of the reasons I made the trip over. They played a great of songs but sadly because of the early start there were not too many people to see them. I later got to hang out with the band and they said that they were scheduled to play early because the organizers wanted to get more people right from the start. I guess it didn't work out as well as planned because people were coming in during their set. They played songs from both of the cds ("s/t" 1990 and last year's "Slumber With The Lion") - they have great songs, so buy the cds! I have waited to hear "Cowgirl" live and it was indeed played, so the waiting was worth the wait. Guess who played bass for the band? Björn from Street Legal! He enjoys Red Bull and Vodka. Ok enough of them for now...Look out for an interview with Solli soon. Vesa: Next to hit the stage was Arabia. I didn't know what to expect, but the band was a really nice suprise and vocalist John Blaze can really sing. They played a bit heavier stuff than Sons Of Angels, but it was still a great set. "Heart Is The Lonely Hunter" is one standout title that I remember from their set, and when I get to listen to the CD I'll probably recognize some of the other songs. Nice bunch of guys too. Vesa: Next up was Brighton Rock and guess what? They were also great. They sure had fun playing and people seem to enjoy them a bit more that the two previous bands. Thanks Mark for the drumsticks. Great set and once again really nice guys. It seems like I'm repeating myself here but none of the bands disappointed me so far. I can't wait to get the live cd from BR. For me it was time to take a break so we went out for a walk and ended up in a pub. We happened to see some Arabs demostrating and shouting "Bin Laden". This is something that I don't understand but I guess there is room for all of us living on this rock...personally I wouldn't mind Bin Laden to be hung by his nuts, but that enough of politics. Jorge: I listened Silent Rage for the first time, when I decided I was attending this show. After giving them quite a few spins, this was IMO one of the bands to watch out for. And I was right, very good show indeed. Listening to a band with three vocalists live is something you don't come across every other day, and for sure, it makes the sound spectrum of the band wider, if you know what I mean. Their set, (time limited just like all the bands playing), was mainly focused on their latest release "Still Alive", to be released this week in Europe. I bought it that very same day, thus I wasn't as familiar with their new stuff, which, by the way, sounded good, as with the (sadly) few classics from their previous albums. Only downside to me was that they gave their set a heavier approach, tending to make the song longer and, IMO, a bit too hard to swallow. All in all a good show and as I already suspected, one of the pleasant surprises of the festival. Jorge: Another band I had never listened to, until just some weeks before the show. Some friends attending last year told me how great these Canadians are live, and let me tell you, they were absolutely right. Excellent musicians, really good, tight sound and a great vocalist. They left me with my jaw dropped, but what's more, quite a few people who saw them last year told me they were even better than this year. Anyway, despite of their nu-metal look, these guys can rock hard (and melodic) and they gained the attention of the audience. They tore the house down, and almost literally, as when the vocalist climbed up the PA speakers, those below there feared for their lives. ;) If you ever get the chance to catch them live, (for instance, those of you able to attend to September Z Rock Canada), don't miss them, as they are really really worthy. Vesa: I have heard Von Groove songs but live they somehow disappointed me. Don't get me wrong, they weren't bad, but there was something missing from their set. Once again nice to see them live anyway, and it was pleasure to talk with the guys. Vesa: Humanimal... that guy Jeff Scott Soto knows how to sing! They played Talisman songs too but don't remember which. Some might wonder why I do't remember everything it was just because I was having fun talking and drinking. Sorry, but I know Jorge will have more on some of the bands. Jorge: Humanimal were one of the main reasons for me to travel to the show. Being a long time Jeff Scott Soto- and Talisman fan, I had to see them live. Well, Tomas Brolin had some problems with his flight from Copenhagen, (it got delayed) and they had to move back their set (due right after Silent Rage), giving their turn to Von Groove. The band had no time to do a sound check and were to start in a hurry not to get the show more delayed. The result was the biggest disappointment of the evening for me. The sound was criminally bad, which it made almost impossible to enjoy the set. They played mostly tracks from the Humanimal "s/t" album (not to be confused with Talisman albums with the same title, parts I and II). But I noticed the songs were not enough rehearsed, (I talked to Jeff Scott Soto later and he confirmed my suspicions), as JSS got wrong twice with the choruses with Pontus Norgren nodding his head in disapproval. Pity indeed, as it is not every day you have the chance to see these amazing musicians playing live, and I got a feeling of anger at the bad luck they had with their sound. Now all I can say is that I wish they'll play on Z Rock Spain next year and we all can witness a much better set and with the sound quality they deserve. Let's hope so! Vesa: Bonfire took the stage next and they played their songs well and they have plenty of them but they all sound the same live, plus I was too busy with the guys from SOA to concentrate to the Bonfire set. They however played "American Nights" that reminds me of my stay in the States. By this time I have had so many beers in me that I was suprised that I could stand up anymore. Jorge: Let's make it clear from the beginning, I never was a Bonfire fan, always found this band way overrated, had the chance to see them supporting Judas Priest many moons ago and they didn't do it for me. Thus, I watched his performance at this year's show in a let's say distant mood. Some thoughts: Claus Leissman is not a great singer, efective, but not impressive. The band have experience enough to know how to get the crowd on their pocket, and so they did on this show. 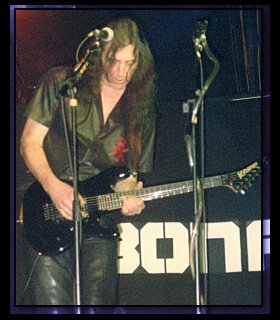 This being said, it wouldn't surprise me at all if Bonfire becomes one of those living dinosaurs on melodic rock who can make a living by playing live, no matter if they only release an occasional album once every ... let's say 6 years? Vesa: The final chapter of the evening was Westworld. They were good, but why didn't they play a Danger Danger song because both TNT and Riot ones were played. Ronnie LeTekro (of TNT fame) joined the stage and played awesomely. Tony Harnell is a hell of a vocalist and I can't wait for the new TNT album! I was pumping my fist right in front of Bruno because he is the man I came to see. I really wanted to talk to him but somehow we didn't meet. I now wish that I would have had a bit more in me so I could have joined the bands' after-the-show party at their hotel but 20 litres of beer in one weekend is enough. Jorge: Westworld was my other main reason to attend to the show. It's only once in a lifetime that you can see two of your all time fave vocalists live in the same show. In my case, they are Jeff Scott Soto and Tony Harnell. And the latter addition of Ronnie LeTekro making a guest appearance at Westworld encore made it a dream come true to yours truly. I've been listening a lot to Westworld lately, and IMHO they are one of the most original, fresh sounding bands on the melodic rock scene nowadays. The luxury line up can be a bit deceitful, as so many times we've seen these kind of "supergroups", failing to get the best out of each individual musical talent. Well, rest assured this is not the case with Westworld. Undoubtely, the main attraction to most melodic hard rockers may be the mighty giant (not literally, as he ain't that tall :P) Tony Harnell, (useless to say, of TNT fame), but Mark Reale, (Riot), Bruno "fatboy slim" Ravel ;) (need I say Danger Danger? ), John Pincus (Keyboards, Ice Age) and John O'Relly (who played drums with Rainbow, and many more) have each one of them a leading part role to play in this band. The magical chemistry between Tony Harnell and Mark Reale writing songs in this band is plainly out of reach to many musicians. Not only that, but the band succeed on bringing that magic live. They sound as tight as it can gets, Bruno Ravel's back up vocals are simply great, John O'Relly's way of playing drums is shocking and Mark Reale's guitar sounds dense at times while stratospheric at other times, but above all it is him, (as Mr Ravel likes to introduce him "The man, the myth, the legend, the throat"), Mr. Tony Harnell. Having seen quite a few hundred concerts during the 32 years life, one somehow becomes an old dog, not so easy to impress when seeing a band live, but let me tell you all this is one of (if not the) best live vocal performance I've ever seen (and listened to)! 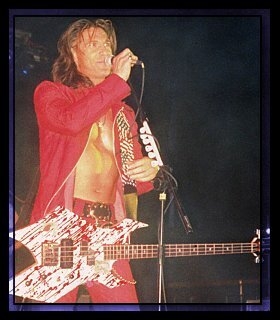 I always loved his voice ever since 1984 and TNT's "Knights Of The New Thunder", and while some people found him a bit of a screamer, most of you reading this will agree over the years he has thrilled us on every TNT album. I'm not going rave about his undoubtful vocal abilities, but I am going to talk about the sensational turn Mr Harnell has made regarding his way of singing since both TNT's "Transistor" and Westworld's "s/t" were released back on 1999. It is my personal guess that he has rediscovered himself singing in a more laid back, mature way and he's really enjoying himself and this new approach. Don't get me wrong, this doesn't mean he's not able to shout his lungs off whenever he wants to, and those of you who were there last sunday can give proof of it; it's just a case of well achieved maturing, so to say. Now, here's another reason to really admire this artist, (as if I needed any more!). 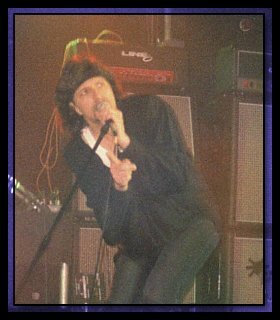 The songs went fluently, effortlessly from his throat, combining both the "old Tony Harnell" and the "new one" way of singing. The band connected with the audience right from the beginning, these guys have a remarkable sense of humour, (specially both Tony Harnell and Bruno Ravel), and they had almost as much fun playing as we had seeing them. They gave a review of their live album (from which I personally missed "Uninvited" as it is one of my fave Westworld tracks), but sadly they didn't play any songs from their forthcoming album, due in July. Now I just can't wait to listen to it. 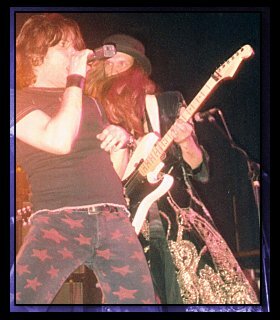 Then the time had come and Mr. Ronnie LeTekro appeared onstage, longtime Tony Harnell's partner (or brother as he called him) from TNT dressed in a quite peculiar way as you can see in the pics. Surprisingly enough, the first song they played was not a TNT one but an amazing rendition of Black Sabbath's "Neon Knights". WOW, how's that for a surprise? Right after that Ronnie played the intro riff of "10,000 Lovers (In One)" and they blew off the roof. They put an end to this sensational night with Riot's classic "Swords & Tequila". Some people complained for two reasons: a) there were songs from both Riot and TNT, why not any Danger Danger? Now that would have been interesting, Harnell's approach to that kind of stuff, me thinks. And b); die hard fans got disappointed because they didn't played any other TNT classics, but if you take into account that time to prepare a set like this for such extremely busy musicians is very limited, and anyway Westworld are already used to playing "10,000 Lovers" at their gigs, one can fully understand. 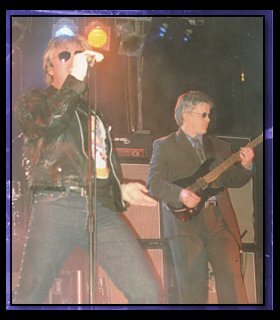 All in all it's a great appetizer for things to come as at the end of the show it was announced that TNT will headline Z Rock UK 2003. Catch ya there! Setlist: I Belong, Skin, Uneasy, Black Shadow Symphony, Ivory Towers, Ice Queen, Shame, Bring The Water To Me, Neon Knights, 10,000 Lovers (in one), Swords & Tequila. 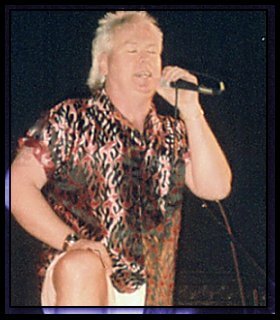 Click here for more pix from Z Rock 2002! Jorge: It's been quite a while since I was in England for the last time (back in 1995 to see Queensryche at the Royal Albert Hall in London). 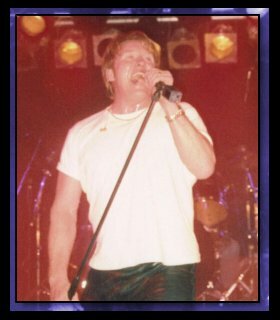 It was my first melodic rock festival abroad, and also my first time in North West England. The chance to catch two of my all time fave singers (Jeff Scott Soto and Tony Harnell) playing live at the same show was just something I couldn't resist, thus off I went. At the same time, I was travelling with some friends, (10 people in total), which always make the experience more enjoyable. And talking about enjoying... here are the highlights of our trip (Z show not included, as is reviewed above). Maxime's monthly AOR / Melodic Rock night: it's worldwide famous, and after being there I must say it deserves its fame, the atmosphere is like going 15 years back in time, excellent music, great sound, great looks and, why not? really nice looking girls! ;) While I was there I had the chance to socialize a bit and meet some people who have helped me a lot while preparing my trip, (you'll find their names on the thank you list below), and also some native fans, talking to whom was a pleasure and a nice start for such a great weekend we had there. Sunday was packed with surprises, emotions, feelings, and such. We met some really nice and friendly people, I'll only mention here it was my first chance to meet one of my long time online friends from the AOR-Europe.com staff, Vesa, great guy, (in all senses!). ;) Of course, having the chance to meet so many great musicians, (and even greater persons), and some long time idols was like a dream come true... Vesa's heart almost collapsed when he saw Danger Danger's Bruno Ravel, so did mine when I saw Ronnie LeTekro entering the venue! Right after the show, Mr Fatboy slim, errr... Ravel, I mean, was so kind as to invite me and a group of friends to the post show party held at the hotel where the bands were staying. 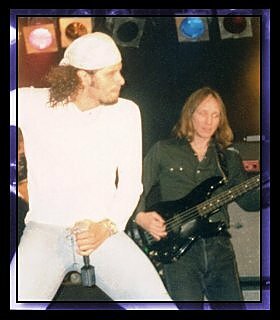 It was the musicians, (JSS, Marcel Jacob, Bjorn Boge, the SOA guys, Ronnie LeTekro, Tony Harnell, Bruno Ravel and Jeff Scott Soto, to name but a few), a bunch of fans, and some local media (the UK is in Europe, AOR-Europe is as its name states, a European site, thus we were local media, somehow);) All in all we had a great time finding out how down to earth and great people these guys are, and we had the chance to chat quite a bit with them, and gather some juicy news that we'll reveal to you in the weeks to come. Also we made some good contacts with both musicians and local media, which we hope, will give their fruits in the near future. Vesa Nuorala, for being such a great guy. Nice to meet you finally! Bruce Mee, from N&T Records and Fireworks Magazine, for his valuable help while I was preparing this trip. Phil & Sue Ashcroft, from Fireworks Magazine, for all their help and support beyond the call of duty, plus for being such nice persons. Looking forward to seeing you again in Nemelrock and being able to return so much hospitality and good vibes. You rock! Kieran Dargan, from Fireworks Magazine for lots of fun. Dia Duit! Bruno Ravel, for being such a nice guy, hope you had as much fun with us as we had with you. You rock guy! Vesa: It was a hell of a trip for me and I've been paying the price last week, but it was a rock'n'roll trip, so I'm not complaining. Thanks for Z for putting together a show like this. Maybe someday we have something similar here in Helsinki. By the way; SOA RULES!